Your invitation to Diddy’s white party might’ve gotten lost in the mail (again! ), but never fear—there’s a sweet blanco backup plan in Brooklyn. Situated on the border of Cobble Hill and Carroll Gardens, the eco-friendly boutique’s clean, white room designs effectively turn the sleep spaces into their own galleries, letting the original pieces rotating in and out from local artists really pop. But the works on the walls aren’t the only BK-centric thing about the hotel: Nu goes above and beyond to pay homage to the motherland, from its buttery homemade “Brookies” (chocolate chip cookies), to quotes showcased on the walls from famous Brooklynites like Basquiat and Spike Lee. 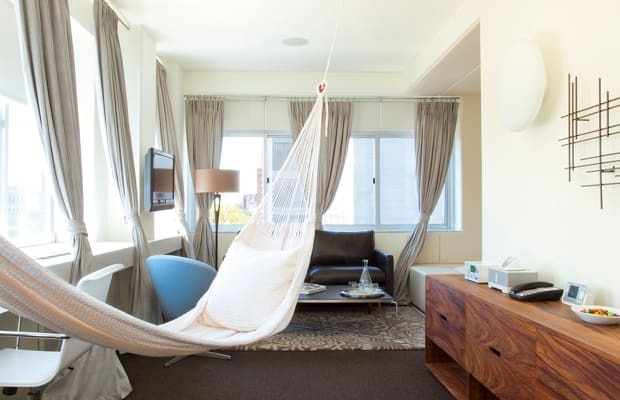 Those seeking mental refuge from the city can enjoy a little escapism via the cozy hammocks in the shockingly affordable Urban Suites (book at the right time and you can nab one for less than $200). With ample sunlight and a minibar concoction in hand, you might just forget where you are. Well, until some trucker outside loudly starts kicking it to chicks on the street.